The challenge mode consists of a large number of tournaments, rewarding you a gold star if you win. Get enough stars and you’ll compete one-to-one against an AI character in real-time, instead of the usual leaderboards. Rather than get bored watching an AI opponent take a shot, it’s a fantastically tense experience as you glare at the screen willing the gods of Epic Fail to strike your opponent down. Seeing the AI shank a drive or miss an easy putt is just ace. As you progress, the tournaments get tougher and may feature different rules such as only having 15 seconds to line up and take a shot or the Mega Cup where the hole is twice as big. Before long, you’ll find yourself playing in rain, strong winds and trying to avoid the never-ending trees, bunkers, buildings and bears. Yes, bears. The mechanics of the game are easy to grasp, yet difficult to master. 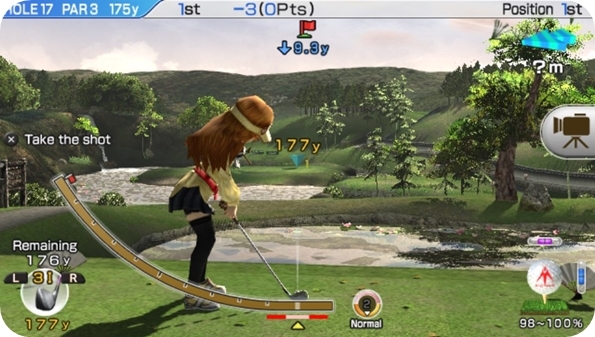 Instead of relying on ‘realistic golf’ analogue swinging, the game realises it is a video games and goes for a traditional three-click method with a power bar. Press X start the swing, press again when the bar reaches the percentage you require and then again to set the accuracy. This final click in the ‘impact’ zone is where the difficulty lies as you need to hit the tiniest marker for a decent shot. Hit it slightly too late or early and your shot is going to veer off to the side. Putting doesn’t require this doomed final click, but you do have to contend with the uneven terrain that’s well displayed by coloured lines with moving dots that indicate the severity of an incline so you can adjust your shot accordingly. The game tries to give you aids (not those ones), with its range of characters, balls and clubs that all have an impact on distance, spin, impact zone and more. So you’d think that a character with an A rank for impact would have a bigger area to aim for than one with a D rank? Well, that would be logical, but no. No matter who you’re playing as it’s generally like throwing darts at hair strands. Sometimes during a round, you’ll notice the zone has grown for one shot, but there’s no explanation why. I swear the game became self-aware at some point, maybe the front camera saw my poised fist over its screen, as after messing up a tournament three times in a row it quickly offered me an ‘easy mode’ with reduced AI. Well played EG, you live to survive another day. Now if you could just cut that friggin’ tornado down a little we can play nice. You’ll not find a launch game that dances all over the love/hate relationship divide so much. At its best, the game is full of rewarding moments. Nailing a long putt on an uphill bumpy green, finding shortcuts or narrowly missing those trees to bounce off the water and onto the green are amongst the best moments I’ve had on the Vita. Having to win tournaments to earn any worthwhile XP can be a real drain though, especially as some of them can last over half an hour only for you to be cruelly screwed by being a fraction of an atom off the impact zone, or the wind marker telling blatant lies. The unlockable equipment helps, but you’re going to have to go through some dark times first. You’re never given any decent advice on how to get better, you’re on your own all the way, which is a weakness and a strength of the game I suppose. Occasionally, you’ll get a nice piece of luck that reminds you of the fun the game can offer. But in the same round that you bounce a shot off a tree onto the green and into the hole, you’ll be stuck on the edge of a bunker, or behind a sign, surrounded by trees. It’s like a horrible portal into what must have been an utterly soul-destroyed Rory Mcllroy after blowing the US Masters last year. Actually, he didn’t blow it; he was screwed by the impact zone. The motion and touchscreen controls have been introduced to non-essential areas of the game, sensibly avoiding messing with a winning formula. You can swing a camera around or adjust the teeing off position, but the only useful addition is using the touchpad as a planner. Drag a marker to any point on the course and it will tell you how far away it is and how far away from the pin you are. This is handy for planning daring (and slightly stupid) attempts at shortcuts across hazards as you measure up the maximum distance of your club over the gaps of your demented stepping stone route. Sure, it’s going to end in disaster most times, but if it works, you’re going to feel amazing. It’s like you’re starring in Tin Cup 2. Multiplayer options take the form of ad-hoc matches, daily challenges or online tournaments. The online features don’t actually go live until the 22nd of February and while we appreciate other UK sites having a good guess and evaluation of these features without playing them, we’ll wait and get back to you with something a bit less made up. The Short Version: Have something cheap and breakable on standby, as this game will send you into such sudden rages you will have to break something. 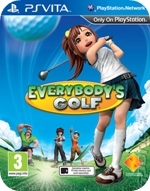 Despite the schizo-cruelty I can’t help but love this game as once again it provides the best golf in gaming today.